Prom Makeup 2014 Ideas and Looks. Makeup Ideas for Prom 2014. Keeping your makeup as trendy as your dress on prom night is the best recipe for a glamorous night. 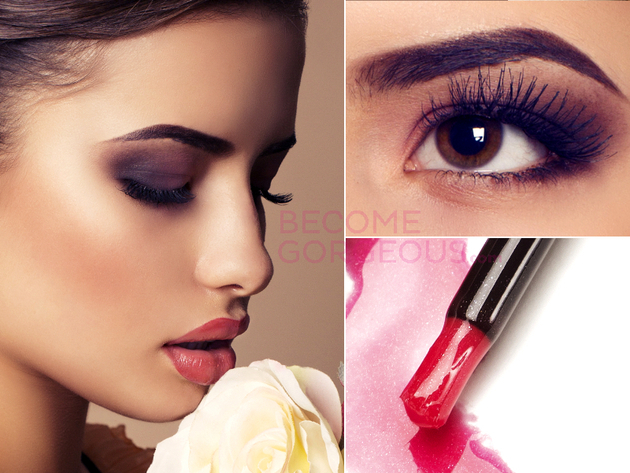 Whether you’ve picked out your dress already or are still looking for the perfect outfit, discover a few fantastic makeup ideas for prom 2014. From bolder trends to the right way to do natural makeup that really draws attention to your features, try these makeup trends for prom 2014 and pick your favorite in advance, so you’ll have time to perfect it for your big night. If you’re looking for timeless elegance, you can’t go wrong with a bold lip, along with more neutral makeup. You don’t have to stick to reds if you don’t like them, try anything from mandarin and bright pinks to plum and violet shades. If you’re going with a cool purple inspired by Radiant Orchid, Pantone’s color of the year, stick to reddish shades for warm skin tones. One of the best makeup ideas for prom 2014, metallic eyeshadows don’t work well with bold lips, but will make your eyes the center of attention. Avoid a strong metallic shade if your dress also has a metallic vibe, because your look might end up too costumey. Soften your silver eyeshadow with a touch of purple eyeshadow for a trendy look. Blending kohl eyeliner for a softer smoky eye is definitely one of the best makeup ideas for prom 2014, but if you want a more defined smoky look, you should go with two or three shades of eyeshadow and a softer pencil. You can easily find smoky eye kits, but make sure that you don’t go too shimmery if your prom dress is also shiny. You don’t have to stick to smoky eyes for an elegant and sophisticated look for prom. Creating a cool colorblocked effect with a touch of ombre is easy with two lighter shades. To get the flawless look you want, select your colors and start with the lighter shade at the inner corner of your eye. Apply it on your entire eyelid, the start blending the darker shade from the middle of the eyelid towards the outer corners of your eyes. When it comes to glitter, less is more, so a touch of shimmery eyeliner on your lower eyelids is one of the trendy makeup ideas for prom 2014. Go for shimmering liner in a lighter shade that your eyeshadow for your lower lashline to really make your eyes pop. Make sure you choose a color that creates contrast without going too far. If you think cat eyes are too much for prom, get a softer look with the kitten eye. Even if you want to go darker and dramatic, keep the wings smaller for a cooler effect. You’ll need a very smooth eyeliner and you don’t have to do it in one stroke. Instead, use smaller strokes to dab it on before finishing your perfect kitten eye look. Start with highlighting primer if you want a natural look for your prom makeup, but don’t say no to peach blush for your cheeks. You can go for a pinkish hue of peach blush, but the key to any look is adding the shimmery highlight first, before your foundation. Complete your look with a touch of mascara and a subtle lip. Feel free to interpret one of the top makeup ideas for prom 2014 and give it your own spin. If you feel the black and silver smoky eye is just too much, go for a different version with light gold eyeshadow and a shimmery bronze shade. The bronze should go at the outer corners of your eyes, but it can easily become too busy if your skin isn’t matte. Get a beautiful rose gold effect for your eyes by mixing two shades the right way. You’ll need an orchid or light mauve shade to apply on top of the original champagne eyeshadow. For the perfect rose gold look, put the orchid shade at the crease and blend it very well towards the outer corners for a glamorous effect. Whether you’re going for a more natural look or adding a bold lip, one of the best makeup ideas for prom 2014 is to use falsies to get beautiful and thick eyelashes that really draw attention to your eyes. You can find them in easy to glue strips that will stay put until for your perfect evening.